Feddes Repert. 105: 347 (1994). Origin and Habitat: South Africa. Northern Cape (Steinkopf and Aggeneys to Wallekraal and Loeriesfontein) and northern Bushmanland. Widespread (Extent of occurrence 25 429 km²). Habitat and Ecology: Desert, Nama Karoo, Succulent Karoo. Brunsvigia namaquana is a deciduous bulbous herb that is quite common in rocky quartzitic slopes, quartzite inselbergs and granite outcrops. B. namaquana in its natural habitat flowers erratically any time from November to May (early summer to late autumn), usually in response to brief, sporadic rain showers. The population trend is stable and not in danger of extinction. 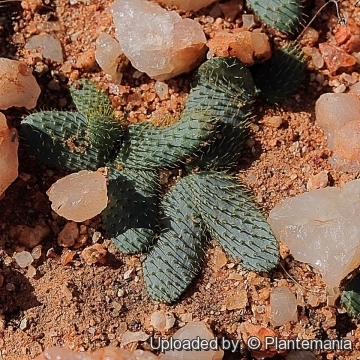 Description: Brunsvigia namaquana is one of the choicest of South Africa's smaller amaryllids (2.5-10 cm tall when flowering) found in quartzite and granite outcrops in Namaqualand. It has zygomorphic flowers and a very unusual foliage with leaves covered in golden bristles, two characteristics not common among species of Brunsvigia. In mature plants the leaves are flat on the ground. The flowers are pink with a yellow-green throat in a small head. 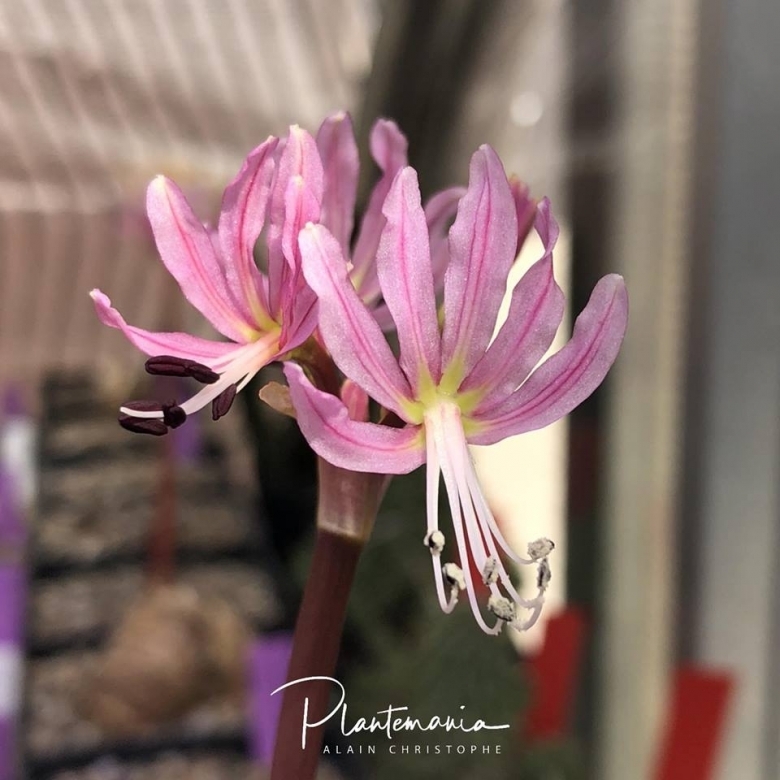 It flowers in response to autumn rain (or watering in the greenhouse) and later produces the characteristic prostrate hairy leaves. This took 10 years to flower from seed. Bulb: Ovoid, 20–35 long, 15–28 mm in diameter, sometimes with a neck up to 50 long, inner tunics fleshy to papery, outer tunics brittle, tan-coloured. Leaves: The bulb puts out 3-4, occasionally 2, leaves absent or emerging at flowering in autumn. The blades usually lay flat or nearly so on the ground are strap-shaped to narrowly elliptical 14-100 mm long, (7–)10–12(–18 or more) mm wide, pale green, often flaccid and have pustules bearing conspicuous, pale- to straw-coloured bristles 2.5–5.5 mm long, either concentrated on the longitudinal veins or densely scattered over the upper surface. The bristles are straight and pliable. The lower surface is smooth. The leaf margin is thin-textured, micropapillate and without bristles. The presence of bristles is unusual in Brunsvigia and is rare in Amaryllidaceae. Inflorescence: 4–8(–11)-flowered loosely spreading at anthesis. Scape erect, 15–60 mm long, pinkish brown. Spathe valves 2, 13–30 mm long, membranous, pink. Bracteoles filiform. Pedicels 10–30(–55) mm long, pinkish brown. Flowers: The flowers are zygomorphic, pale to dark pink, with darker pink veins, yellow-gree to cream-coloured throat with declinate to spreading stamens of variable length. Tube up to 1.5 mm long. Tepals recurved and widely separated from others, narrowly oblong–lanceolate, 11–24 mm long, 2.5–4.5 mm wide. Stamens of different lengths, about as long as or up to 8 mm longer than tepals. Filaments pink with pale green at base coalescent basally for up to 2 mm long. Anthers, maroon, pollen cream-coloured. Ovary 3-angled, 2–4 mm in diameter, brownish pink to greenish pink. 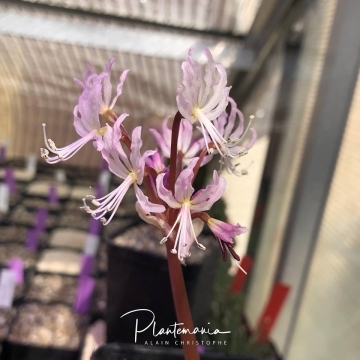 Style slender, white to pale pink, up to 21–32 mm long, exerted well beyond stamens. Stigma trifid. Fruits (cacpsules): Small (8–15 mm long, 7–13 mm in diameter), heart-shaped, thin-walled splitting open readily down the septa for half or more of their length. Seeds: Subglobose, fleshy, about 3 mm in diameter. Similar species: B. namaquana is similar to Brunsvigia radula. According to Müller-Doblies and Müller-Doblies (1994), B. namaquana differs from B. radula in leaf number per season, (2)3 or 4 vs. 2 or (4), leaf width, (7–)10–12(–18) vs. (24–)36–45 mm, stamen orientation, declinate vs. spreading, and stamen length, 1.5 times longer than the tepals vs. slightly longer than the tepals. In addition, lateral appendages at the base of the filaments, when present, are narrowly winged in B. namaquana. 2) Hilton-Taylor, C. 1996. “Red data list of southern African plants”. Strelitzia 4. South African National Botanical Institute, Pretoria. 4) Snijman, D.A. 2012. “A revision of the Brunsvigia radula-group (Amaryllidaceae: Amaryllideae) of species in South Africa, including the description of Brunsvigia gariepensis a new species from Bushmanland in Northern Cape”. South African Journal of Botany 79(1):106-116. (PDF Download Available). Available from: https://www.researchgate.net/publication/257081241_A_revision_of_the_Brunsvigia_radula-group_Amaryllidaceae_Amaryllideae_of_species_in_South_Africa_including_the_description_of_Brunsvigia_gariepensis_a_new_species_from_Bushmanland_in_Northern_Cape [accessed Jul 29, 2017]. "The Families and Genera of Vascular Plants III, Flowering Plants — Monocotyledons Lilianae (Except Orchidaceae)". Springer-Verlag, Berlin, pp. 83–110. 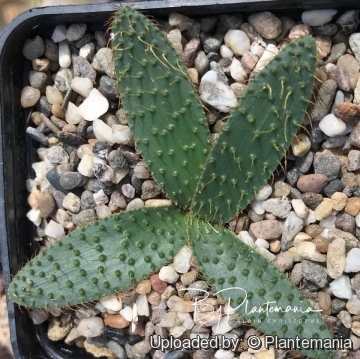 Cultivation and Propagation: Brunsvigia namaquana is not common in cultivation and grown only by specialist bulb-grower. It presents no great difficulty in cultivation. The ease of culture make it an invaluable subject for the impassioned bulb-growers. Soil: This species, like all other brunsvigias and amaryllids, requires very well-drained soils. 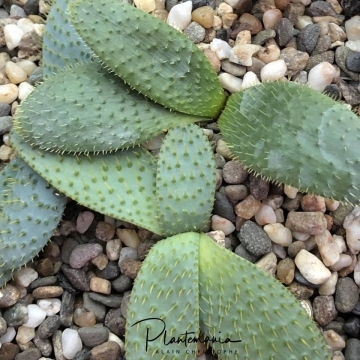 Grow them in a well drained mix in an unglazed terracotta pot so that they dry rapidly after watering. Use an open medium comprising equal parts of well decomposed compost or finely milled bark, and river or silica sand (or pumice). In a plastic pot cut way back on the potting soil and use a mostly inorganic mix. Plant the bulbs with the neck at, or just below soil level and can remain in the same position for many years. Give it excellent drainage. Watering: As it is a deciduous winter-growing plant, it likes moisture from late summer to early spring. Start watering in early autumn and keep the pot outside during dry weather until the first frosts threaten. Then bring the plants inside and continue watering weekly or biweekly depending on how sunny the weather is, although they do survive heavy winter rainfall. Withhold whater from late spring to summer (dormancy period ). Garden uses: In warm and temperate climates grow it shady courtyard gardens, in raised beds, shaded rockeries. The plants are mostly grown by specialist bulb collectors, usually as container subjects. Propagation: From seed. Seeds form readily and should be harvested and sown as soon as they can be easily removed from the capsules. The seeds germinate without difficulty. As soon as the seeds are ripe and fleshy they can be sown directly into a well drained sandy/loam soil. Seeds may take up to two months before the first leaf appears above ground, and a further 10 to 20 years to flower for the first time. Seeds should be sown 5mm below the soil surface. Do not sow the seeds too deep. If it is the intention to plant these seedlings out into a bag or pot, they can be transplanted in their third year. Once planted in a permanent position do not move them around – they will not flower if they are constantly dug-up and moved from one location to the next. A word of caution - do not plant the young bulbs too deep. Ensure the slender neck of the bulb is just protruding above the soil with the bulb part underground.